Dragon returns to action as the Rumble Brothers and the former Annihilators raid the precinct of the Chicago Police Department. He defeats the majority of the villains which prompts the remaining super-freaks to surrender themselves to police custody. Frank Darling informs Dragon that a breakout has commenced at Stronghold Penitentiary and that the officials there are requesting his presence. At the Freak Outpost, Howard Niseman demands to be released but as Inferno warns him about being raped and killed, Evil Eye comes crashing through the door. Star follows through and renews his rivalry with Inferno. The vigilante causes his opponent to burn through the wooden floor which takes him out of the fight. Star then releases Howard who asks about the location of Chris Robinson but he is assured that his partner has somehow gotten free, keeping his secret identity hidden. A number of heroes that includes Dragon, Freak Force and Liberty & Justice are briefed on the state of the riot occurring throughout Stronghold. As they make their way through the facility, a huge door is closed to protect the villains. Mighty Man smashes through the barrier which prompts BodyCount to ready his cybernetic weaponry. SuperPatriot opens fire first and shoots a huge hole clean through the super-freak’s torso and kills him. Mace is disgusted that he has been locked up with criminals and uses the breakout as a distraction for him to make his escape. He seems to be led through the complex as doors open in a specific pattern which leads him to the OverLord armor. He dons the armor and confronts the heroes, desperate to reclaim his freedom. Dragon goads him into acting and Mace is shocked by an internal failsafe, with Dragon explaining that OverLord had made it so that no one else could use his battle-suit. Howard arrives on the scene with guns blazing as Star causes Mako to punch an electrical conduit which takes him out of the fight. 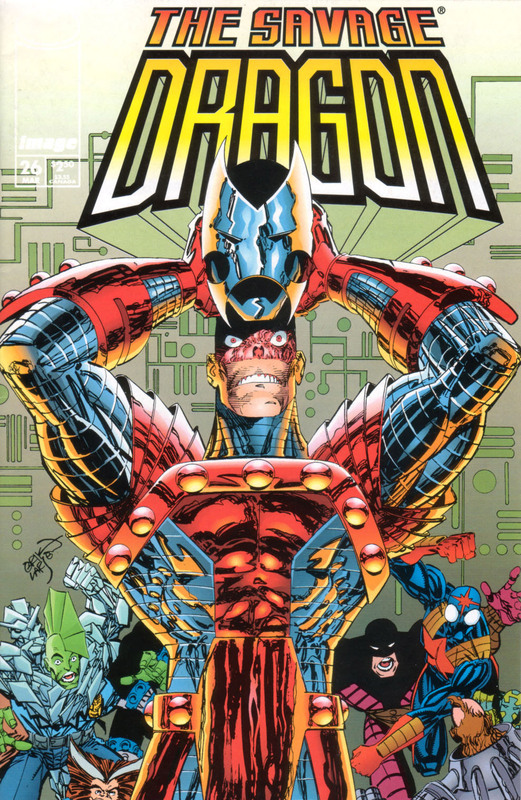 An array of lasers are activated which threaten the lives of the heroes but Dragon shuts down all of the prison’s power. Although the villains could theoretically release one another, Dragon figures that they can deal with them on a case by case basis. A few prisoners manage to escape but the majority of the inmates are soon rounded up. Some distance away from the battle, the Vicious Circle gathers together where Brawn congratulates CyberFace on his success. CyberFace had remote controlled the computer systems of Stronghold Penitentiary so that he could release many of his allies but also cause the downfall of Mace. The celebrations are cut short as Chelsea Nirvana leads her army of super-freaks to a confrontation. Bludgeon moves to take out CyberFace but is stopped instantly when his costume’s mechanics are used against him. CyberFace then causes the heads of several of Chelsea’s followers to explode before Negate steps forward and neutralises her, transforming her from the appearance of Johnny Redbeard back into an ordinary man. The Vicious Circle and their rivals all retreat through a portal opened up by Gateway but the Nixed Men make one last attempt to recruit She-Dragon. She refuses to abandon who she believes to be Johnny Redbeard and is thanked by Dragon for alerting the authorities to the villains’ gathering. Any doubts as to her allegiances have been put to rest. In the apartment of Amanda Mills, Peter Klaptin awakens from the crash-landing he made as he entered through her skylight. He is confronted with news footage of Star taking part in the recent Gang War and admits that he is not Star. Peter explains that he was beaten up early on in his career and hired someone to continue with the identity of Star but claims that it really was him that saved her life.